Sorry, this Irish angel tree topper is now sold out. This Irish Christmas angel features 10 bulb illumination that includes a candle in each hand, and she may be used as a tree topper or as a centerpiece decoration. The Irish angel tree topper features red hair with curls along with a dress that is enhanced with shamrocks. 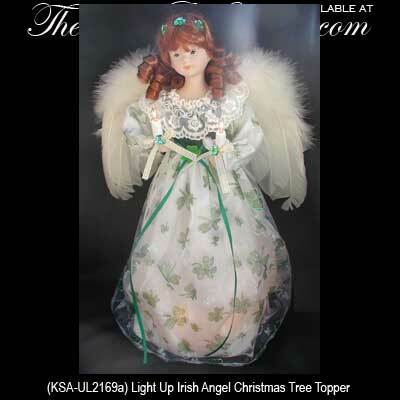 The 13" tall Irish angel is made of fabric and porcelain by KSA; an electric adapter is included.